The security camera with LED lights enables you to see things clearly in complete darkness. Why do security cameras have red lights? Why do night vision cameras use infrared? Can I see infrared light or flash at night? How to disable the red LED light on security camera? Is there any night vision security camera without LED red lights? In this post, we are gonna deal with all these questions and help you to find out the best security camera with LED lights that works best for your security needs. Additionally, we’ll take a look at the dummy security camera with motion detector and led light. Is it useful or simply a waste of money? If you have other confusions about security camera with LED lights, you are very welcome to leave them on the comment area, and I’ll get back to you ASAP. The security camera with LED lights, which is also called night vision security camera, can “see” objects clearly in low-light or even no-light conditions, with black and white images. 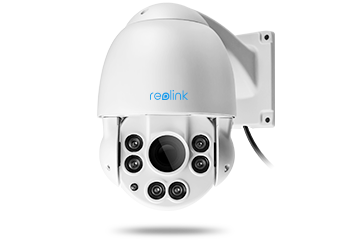 Currently, the CCTV camera with LED lights is the most energy saving and reliable way to produce night vision with the best image clarity and no worries of the bulb failure or down-time. The LED lights will send a lot of infrared lines (typically at a wavelength of 850nm) to the object, and the camera lens will then detect the infrared radiation (IR) reflected and produce pictures. That’s why security cameras have red lights. Attention that you will not actually see the infrared light coming from the security camera – it is invisible to the human eye, but you may notice the red glow of the LED lights. But the LED lights will not be too bright or obvious, and there are big differences between the dummy CCTV camera with flashing LED and the real one: The real security camera with LED lights will never flash, and it will not glow in the daytime. If you are looking for a real security camera with LED lights to offer you a real peace of mind, here is the top pick, featured in media like the VueVille and Androidpit. 6pcs high quality LED lights enable you to see up to 190ft in total darkness, making this camera one of the most popular night vision security cameras. With the class-leading 5MP resolution and 190ft excellent night time visibility, this CCTV camera with LED lights can well cover your long driveway, the shed, the stable, and the parking lot even in black dark. How does the security camera with LED lights work in the real world? Pro tips: Remember not to aim the security camera with LED lights through the window at night to avoid the infrared reflection, which will cause possible glare and fuzzy videos. As I mentioned, the security camera with LED lights does have a visible red colored LED lit when the invisible infrared light is being emitted, as a necessary by-product. Annoyed by the red light and don’t want it to draw attention, attract bugs or disturb animals? Can you just turn the red light off? 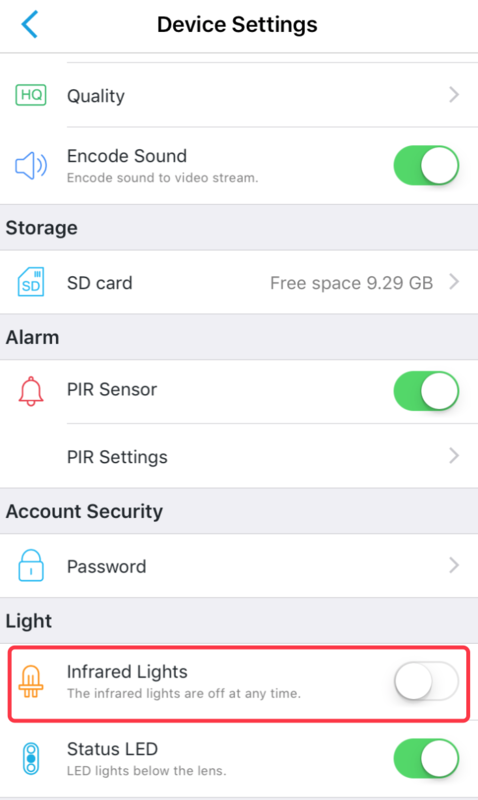 Just come to the camera setting menu via the free Reolink software, go to Advanced Settings > Infrared LED, and then you can enable or disable it freely. If your security camera with LED lights doesn’t offer this option, you may simply hide the IR illuminator glow by using some black tape. But remember that, in this case, the security camera with LED lights will be unable to see at dark. So is there any night vision security camera without LED lights or red glow? Disable the IR lights following the above steps and install a supplemental IR illuminator to help the camera see at night. In that way, the IR LEDs are not located with the camera, so you don’t need to worry that the red light will attract attention. How about the dummy CCTV cameras with flashing light? They will probably not work. The rotating imitation security camera with LED could be easily recognized by burglars. Actually, the LED light status can easily give you away if it is flashing all the time even during the day time or it is too bright and obvious, as what I mentioned above. There are even dummy security cameras with motion detector and LED lights, which will automatically rotate back and forth as if they are tracking the movement. However, the real security cameras will never physically move to track the people walking by. They just record the whole events without your notice. So the burglars will know it if you use a fake security camera with motion detector and led light. And the best solution is probably to mix the real CCTV camera with LED lights with the fake ones. 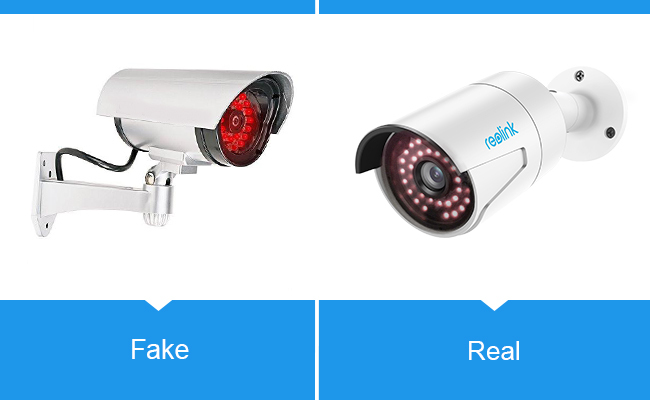 In fact, there are a lot more easy ways to tell whether the security camera with LED lights is fake, check it out here and learn the best solution to keep your home safe. This entry was posted in Buyer's Guide and tagged security camera led, security camera red lights.